Recently, I thought I would make a nice batch of macaroons. After all, macaroons are pleasant. They're nice. They're really easy to make. I had plenty of dough (or is it batter?). And while baking the first tray, I thought to myself, what if I experimented a little bit with various macaroon mix-ins? I happened to have chocolate chips and nuts, so really, that's what I went with. Pecan Macaroons: the toasty pecans added a nice crunch to the macaroons, and made the flavor sort of buttery-rich. A very nice addition indeed, but I suspected that they'd taste even better with chocolate. 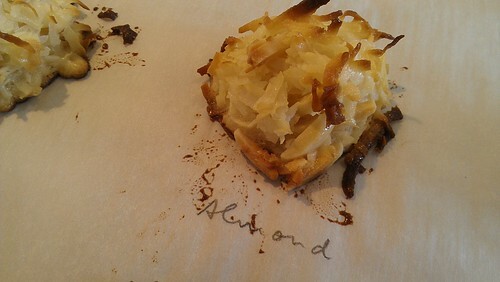 Almond Macaroons: The almond was subtle, working in tandem with the coconut for a slightly creamy flavor. Subtle. Nice, but no "wow" factor. 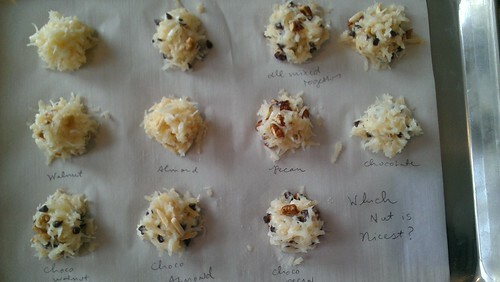 Walnut Macaroons: This was a nice flavor complement, giving the macaroons a decidedly "nutty" taste and crunch. But once again, no "wow" factor. Chocolate Chip Macaroons: Now we're getting somewhere. 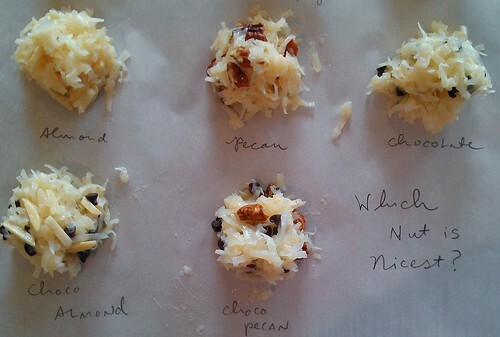 The mellow sweetness of coconut against the rich chocolate chips--a very nice combo. Choco-Pecan Macaroons: Wow, it gets even better! 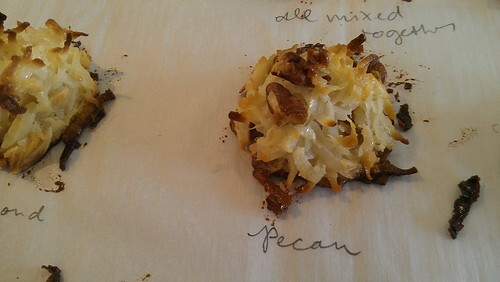 Sort of like a magic cookie bar of a macaroon, this was a very nice combo. I'd eat a whole tray of these. Choco-Almond Macaroons: We're going into Almond Joy flavor territory here, and if you like them, you'll like this cookie combo. If not, this isn't your nut combo. Can you tell I'm not hugely into Almond Joy? 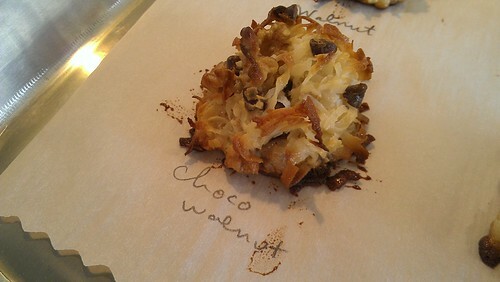 Choco-Walnut Macaroons: Once again, nice. You've got that magic cookie bar thing going on again, and it's a very pleasant association, in my opinion. All mixed together Macaroons: Actually, pretty good. 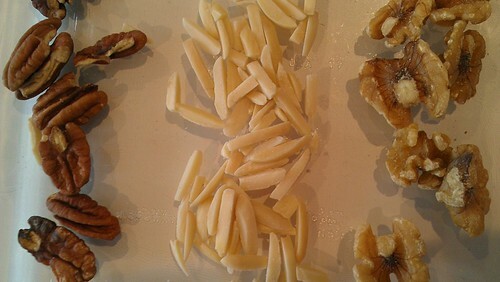 The flavors of the nuts were not distinct, they just kind of merged into "nutty" as a flavor profile. But combined with the chocolate, nutty was not such a bad thing. I'd do it again. I have no regrets. Overall? 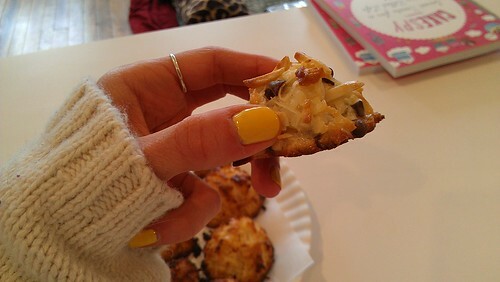 My favorite combo was the chocolate chip pecan macaroon. They had contrast, texture, and a great flavor. 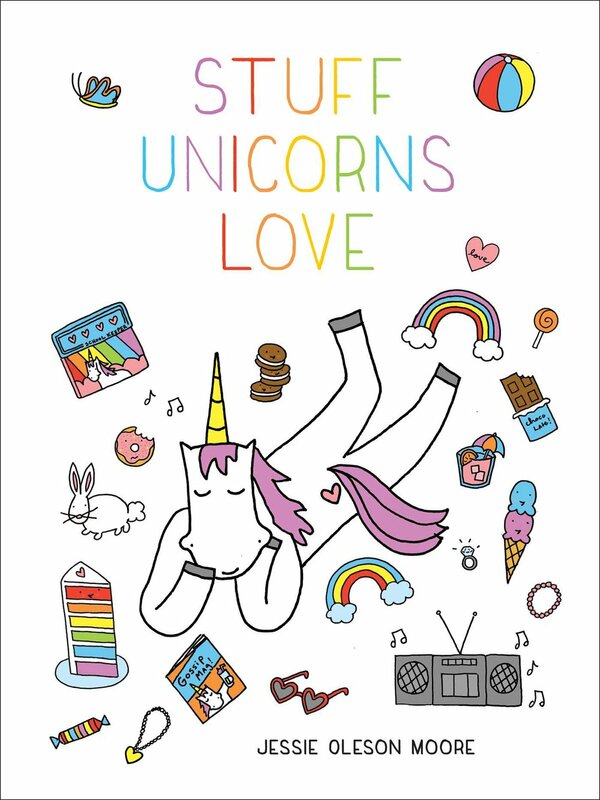 I want to eat my weight in them, and I think you will, too. Here's a recipe. Preheat the oven to 325 degrees F. Line two cookie sheets with parchment paper. Combine the toasted coconut, condensed milk, and vanilla in a large bowl. Set aside. Drop the batter onto sheet pans lined with parchment paper using either a 1 3/4-inch diameter ice cream scoop or rounded tablespoonfuls. Bake for 20 to 30 minutes, until golden brown. Cool on the sheet for several minutes before transferring to a wire rack to cool completely.